First, a bit of background: I met Clay when he worked on the Dean campaign, and I was a very active volunteer from Illinois. The Dean campaign was full of smart, idealistic people like Clay - and for much of the summer and fall of 2003, it looked like smart and idealistic was going to take our country back. It was fun while it lasted. I remained friends with Clay and active in politics after the Dean campaign ended. I had the incredible opportunity to be the lead blogger on then-State Senator Obama's campaign blog. I eventually landed at a startup in Chicago, which was then acquired by Google and we moved to California. Over the last 4 years, I've become frustrated by the seeming broken-ness of the political system. Conservatives watch Fox News and read Drudge, liberals watch MSNBC and read Daily Kos. Both are not only certain they're right, they're flabbergasted that the other guys are dumb enough to fall for the obvious agenda of their news outlet of choice. Through some combination of my law school training, some of that latent political idealism, and having some family members whose opinions diverge with my own but are often exceptionally well-informed, I actually want a strong opposition (whether that happens to be my team or the other team - doesn't matter). I believe that the other side of the aisle often has points that are not only valid, they may actually be convincing. Though I strongly identify with many of the core ideals of the Democratic Party, I have frequently voted against candidates from that party. Clay's own evolution - from campaign operative to political activist to transparency advocate to author - echoes some of those same concerns. Once he understood that much of what he was working on was treating symptoms rather than the cause of the problems he was confronting, he set out in search of the root cause. And that's where the Information Diet comes in. Clay's book is worth your time and attention, and more importantly it should lead to some evaluation of your own behaviors to see how you can get in shape (informationally, that is). Using the analogy of factory farming - drawing a line from the subsidization of cheap calories to a direct impact on the nation's obesity - Clay goes into the trend of mass-produced "content" (not really "news" or even "information", but content). In the same way that cheap calories lead to unfit consumers, cheap content has led to unfit information habits. It's easy to find the content that agrees with you, that reinforces your point of view, and proves, once and for all, that everyone who disagrees with you is an idiot. Problem is, it's just as easy for them to do the same thing. Where that leads us is to a government that's threatened three times in the last five months to shut down over partisan bickering. It leads to the demonization of the opposition, it leads to a total lack of investment in healthy discourse. E-mail: Over the past few weeks, I've unsubscribed from almost every e-mail list I've received mail from. I've removed myself from 40 lists this week alone, and expect that by the time I'm done I'll have left over 100 e-mail lists. If I continue to see mail I don't want, I may give Unsubscribe.com a look. Bottom line - I almost never read the promotional e-mails anyway, and the distraction of seeing the unread messages count increment by one when they come in - resulting in me having to archive/delete/unsub/spam/whatever the message means that it just takes time away from otherwise productive time. Beyond that, I'm going to try very hard to block time to process e-mail (I'm pretty terrible at letting my inbox dictate how I manage my time) and keep Gmail closed otherwise. Production: I recently got a new camera, and this blog happens to turn 10 years old next week. I like producing stuff - but have fallen out of the habit of actually creating stuff I enjoy. In the year ahead, I'm going to focus more on blocking time to write - it's how I learn, since I don't really understand something until I can explain it to someone else. Ditto on the photography - we have a couple big trips planned in 2012 and I want to be good enough with the camera to take pictures worthy of what we're going to see. Politics: I've already cut back dramatically on what I consume on politics; it's pretty much down to Talking Points Memo (its founder, Josh Marshall, has been a friend of mine for 15 years) and Political Wire. To those sources (both of which have a liberal bent, TPM moreso than PoliticalWire) I'm going to add a few conservative commentators I respect (like Reihan Salam from National Review). Beyond that, I'm going to spend more time understanding the local issues in my community - in Illinois I chaired the democratic party in my city, so I knew many of the local officials, understood most of the important issues. Since moving here, I've had almost no contact locally - that's going to change. Social Networks: I'm a very active consumer and producer of info on Twitter, Google+ and Facebook - with very different audiences on each. I don't expect that will change much, though I think like e-mail I'll be a bit more diligent about blocking time when I engage rather than keeping tabs open in Chrome with each service running. 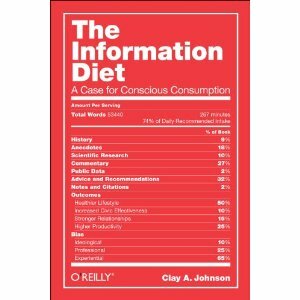 The irony of a book about an information diet producing a blog post from me that runs to a couple thousand words is definitely not lost on me. But that's part of the point: the book's important. It's not a fad diet book, it's a healthy living diet book. In much the same way that turning 40 made me think about what really mattered to me - producing a resolution to be more committed to exercise and a healthy food diet - Clay's book helped me take a hard look at how I interact with information. I'm already changing my behavior, and expect you will to. Now this is interesting! and feeds into my quest of using my time in meaningful ways and with more focussed purpose. Thanks for sharing. Overall a great post and helpful tips about email/rss management! I am looking forward to see pictures from your new D7000.